That's really cute! You always do such a great job! We'll have to fix the flickr thing so that we can post to the blog from your account. I tried already and couldn't do it, but I'll figure something out. 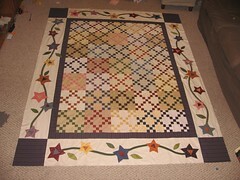 The quilt turned out beautiful! You were fast! That was a lot of applique!